archita August 06, 2018 Jewellery, Online stores, Where to buy? 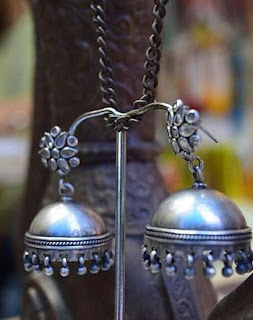 Indian festivities are known for their glam and grandeur and the cute little silver jhumkis or a sophisticated piece of silver necklace can match the tone of Indian festivities perfectly. The way we dress and accessorise ourselves portray our true self. It might be a simple and tiny jewellery piece which adds elegance and style to the entire look. The oxidised silver jewellery adds that extra layer of confidence coupled with drama and is a new favourite of the modern women. So why choose silver and not gold or platinum while selecting your festive jewellery? Be it a light weight peacock shaped silver earring or a thin silver chain, this white metal does not give a gaudy look. For this reason, silver jewellery is perfect for any Indian festivity. You might be performing pooja under the open sky or busy preparing for pooja from one place to the other, silver gives a chic look, irrespective of which hour of the day it is. Silver is good for health! Silver has been known to regulate our moods and concentration levels significantly. It is also known to fight cold, flu and infections. It tends to improve the internal heat regulation in the body, thus improving the immunity level. These health benefits are not magic! It is true science, with respect to the amazing thermal conductivity of the metal. The positively charged silver ions tends to reflect electromagnetic radiation via a conductive field which improves the human body’s internal conductivity via blood circulation. Sterling silver jewellery is known to be the modern women’s first choice as compared to gold. Celebrities have also dived in to the silvery plunge! The white metal rightfully adds a sheer oomph with style to the look, be it a corporate wear, cocktail party, dinner dates or wedding and festivities, as compared to that of gold and other precious metals or gemstones. The oxidised dark hued silver earring or the new genre sterling silver jhumki, it is absolutely versatile, wear it the way you want. Also, dark skin toned people seem to be more comfortable in the modern silver jewellery than gold, as it complements the skin tone gracefully. Most importantly, the price factor cannot be ignored! A college student earning pocket money, an early 20’s individual with the first job or a celebrity, a corporate, lawyer, doctor or grandmas- everybody can afford to buy the amazingly beautiful and stylish silver jewellery, thanks to the price! This is another reason why you can easily gift a piece of Silver is definitely precious, as it stands next to gold in the queue but the versatility and customisability in looks and appearance cannot be ignored. Silver can be aptly said to be “ageless beauty at reasonable price”! Jhumki with Pearls – A pure Rajasthani style of jhumki. Peacock earrings with coloured stones – Ethnic charm of the peacock and the coloured stones make an interesting combination. Danglers with coloured stone – An earpiece with black or red stones embedded in floral pattern add the modern oomph to traditional jewellery! Floral shaped earrings – These are oxidised silver, ideal for gifts and occasional wear. 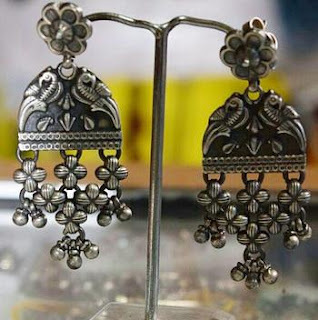 Jhumki with leaf-shaped stones – A masterpiece with white stones and dark hue of oxidised silver! Jhumki with flower-shaped Earring – The oxidised flower adds the traditional charm and reflects the inner diva. Leaf-shaped earrings with coloured stone – An unusual jhumka with sleek leaf patterns ending in coloured stone, is drop-dead glamorous! Once you buy the dark hued oxidised silver necklace, studs, jhumkas or rings, it becomes a part of the asset, considering the fact that you can wear it throughout the upcoming years until you age and pass it on. Preserve them well to retain the lustre and hue. Do not spray perfumes directly on the jewellery. Keep them air tight in beauty boxes when not wearing. Clean with soft cotton cloth. The jewellery designers have a widespread canvass while crafting the intricate patterns on these jewellery, hence get gorgeous everyday!